As impressive as are its capabilities, the Great White Shark cannot survive in isolation. It is an integral part of a complex, interdependent marine community. All coastal ecosystems begin with photosynthetic organisms, which capture the radiant energy of the sun and package it in a form that other creatures can use. These plants are eaten by a wide variety of herbivores, which are eaten by carnivores, which - in turn - are eaten by larger carnivores. In this way, energy gets passed to ever larger animals farther along the food chain. But energy is not transferred with perfect efficiency. As energy is passed from one trophic (feeding) level to the next, about 90% of the energy is lost. Therefore, each trophic level has only a tenth as much living matter as the level below it. 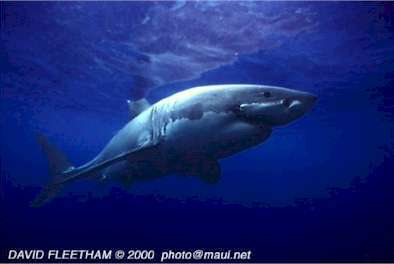 At the top-most trophic level, apex predators such as the Great White reside. Although numerically scarce, apex predators are the 'cap' on the entire ecosystem. It is almost as though everything that goes on in the ocean takes place to feed the Great White Shark. Until relatively recently, we had little idea how much a Great White eats. A now-classic experiment conducted in the western North Atlantic measured the rate at which a Great White warmed its muscles after swimming through a sharp temperature gradient. Based on the measurements obtained, a conservative estimate suggested that — having eaten about 100 pounds (45 kilograms) of whale blubber — a 16-foot (5-metre) Great White may go up to 1.5 months before needing to eat again. Based on the average mass and fat content of yearling Northern Elephant Seal pups, it has recently been estimated that a single pup might sustain a large Great White up to three months. Therefore, the Great White needs to feed on such marine mammals only infrequently and is probably a relatively minor source of young Elephant Seal mortality compared with disease, drowning, and being crushed during battles between territorial bulls. Although clearly a top-level predator, the Great White is not without predators of its own. In 1997 off the Farallon Islands, an adult Killer Whale (Orcinus orca) was observed and filmed in the process of killing and eating a 10- to 12-foot Great White. The attacking Killer Whale may have been protecting its young or eliminating a potential competitor for a prey item. But, despite such spectacular and heavily publicized events, natural predators of the Great White are rare. Humans are by far the most significant predators of Great Whites. The meat of this species is firm, white, and delicious. Perhaps more significantly, Great White jaws and teeth are highly valued world-wide as curios or trophies. Off California, some 10 to 20 Great Whites are killed each year. Until recently, Californian sport anglers took their share of this number, often keeping only the jaws and discarding the rest of the carcass. Today, however, most Great Whites captured off California are taken as by-catch of commercial fisheries. Some of these are donated to research organizations, but others are auctioned off on the Internet. In October 1993, California became the first US state to declare the Great White a protected species (AB-522). From the first day of 1994 onward, it became unlawful to capture any Great White within State waters for commercial or recreational purposes. Any vessel carrying part or all of a Great White caught outside State waters is prohibited from landing at any California port. The only permissible captures of Great Whites are minimal numbers caught as by-catch of commercial gill-netters or those taken under a scientific collection permit for research or education purposes. This law was extended and amplified in 1997 (SB-144) to outlaw all directed efforts to lure Great Whites by any means in State waters. At least within California waters, the Great White is protected by law. But elsewhere along the Pacific Coast, this magnificent and celebrated shark must take its chances. Given the Great White's severely limited reproductive capabilities, it is highly vulnerable to even moderate rates of removal from the breeding stock. One can construct all manner of grand-sounding reasons to conserve the Great White Shark. We can cite its ecological importance, although — truthfully — we do not yet fully understand the nature or extent of the Great White's role in marine ecosystems. We can talk of protecting this animal as a moral obligation, but there is always a danger of conflicting moral imperatives or priorities. Perhaps the most compelling reason for readers of this book to do what he or she can conserve the Great White is also the simplest. The Great White Shark is a rare wild animal that adds to the richness, diversity, myth and mystery of our world.